One end of a string is attached to a rigid wall at point O, passes over a smooth pulley and carries a hanger S of mass M at its other end. 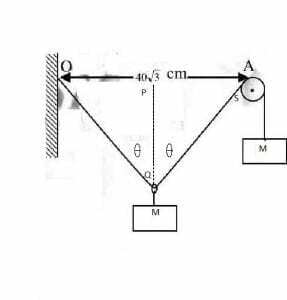 Another object P of mass M is suspended from a light ring that can slide without friction, along the string, as is shown in figure. 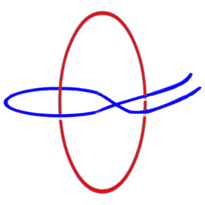 OA is horizontal. 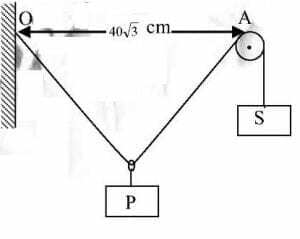 Find the additional mass to be attached to the hanger S so as to raise the object P by 10cm. Let us denote the tension in each string as T.